Loved the location and the feel of the cabin. The only problem we had was that a fan in our bedroom did not work. Both my wife and I are "fan sleepers". Luckily when I called I was brought a fan to use ASAP. I really appreciated the attention to detail and customer service. Liked that the home was clean and well furnished. Location was great. The home was great! Perfect space for our group. Loved the layout and the view was amazing. Great kitchen to cook in. Only thing was that all knives were a little hard to work with.. I would probably pack my own next time we go. Amazing Grace is a wonderful vacation rental. You could not be closer to the water unless you are in it. I had completely forgotten my code to get into the property, and the person who I spoke to on the after hours number was super helpful. Great experience, will do it again! The condo has everything you'd like for a short or extended stay! We loved having three floors and a full kitchen. Having a dishwasher for 6 people was great! The view of Lake Superior couldn't be better from the kitchen/patio and upper bedroom. We loved the fireplace downstairs as well, and having new technology with the nest system allowed us to feel comfortable throughout our stay. The upper beds were also very comfortable, and I'm usually a picky sleeper. What we liked least: TV is small for 6 people downstairs, not enough seating downstairs and in the kitchen too (just need a couple more dining room chairs). Would be helpful to have non-stick frying pans so everything is easier to clean. Sleeper sofa downstairs isn't very comfortable. Dennis and his wife were very nice and accommodating. They answered questions and were ready to assist in any way. We liked the sauna and whirlpool. I liked the home well. The location was farther from Lutsen Mountains than I expected, though still very close. The amenities were sufficient. I best liked the porch and backyard. I least liked the lack of pots & pans for cooking. The service was fine as well. This was my fourth stay at the Aspenwood townhomes. We keep coming back because we love being right on Lake Superior and still only a few miles away from Lutsen Mountains (6-7 minute drive). What a great place and I think I found my new favorite townhome here. It feels larger than it is because everything is separated by different levels, so there is a lot of privacy. I really enjoyed this unit because it's an end unit with lots of light coming in from the windows and great views of Lake Superior from the master bedroom. As always, everything felt well cared for and clean. We didn't venture down to the lake because it was snowing and we didn't want to go down the stairs, but we did notice new stairs had been installed since our last visit which is very nice because the old stairs were a little scary. All in all a great visit and we will be back. I was so pleasantly surprised with everything in this rental! The view was incredible, it was tastefully furnished, and stocked with all of the cooking utensils/dinnerware we needed! Access to laundry was a huge plus and that room was perfect for our equipment! We had seven people and didn't feel crowded at all. Just a quick six minute drive to Lutsen. I loved the view out the patio door. The place was so cozy. I liked the check in method. Being able to show up and walk right in like we own the place. Right to our room smooth and fast. The exploring on the grounds was fantastic. An amazing refreshing stay. Close to the amenities that we wanted like the ski hill and restaurants. Liked the location, but we were disappointed in the lack of shuttle service to lift and restaurant. We called multiple places and no one had a shuttle. Perfect location, great view. Building as a whole is a little dated but we are OK with that. Well kept. The parking lot was scary slippery with ice and could have used some salt. A very convenient place to stay while skiing Lutsen. The hot tub and pool were awesome after the days skiing. Finally on the last day the skies were clear and we got to watch the fabulous sunrise over the lake out our balcony. My only regret is that we didn't stay longer. Love the home, lots of room, fabulous view, close to the state park, had plenty of room in kitchen to cook and eat together. Very well laid out. The decks are wonderful. We wanted something close to snowmobile trails and Lutsen and this was a perfect location. The home is beautiful. Our family had a great time. Perfect location, clean, easy access. Great timely information privided on email and in person over the phone. All questions answered. Very homey. Great stocked kitchen. Nice pool, hottub, sauna. Comfy beds. Liked having two full baths. Nicely decorated. Somewhat frustrated with how to operate tv. Overall, wonderful. Fantastic view. Somewhat dated exterior. Inside a lot more updated/modern than we expected from outside. Very true to photos. I thought the entire process from booking, to picking up the keys to checking out was absolutely seamless and well done. The cabin had everything I needed to enjoy a little getaway. I'm online right now booking it again! 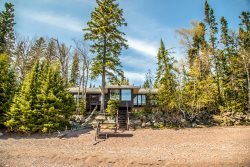 The location is perfect; right on the shore and only 1.5 miles from Grand Marais. Nice n quiet as the other cabins were empty when I was there, I believe. I love love love the deck even though the railing is a little low. There's just something purely magical about being so close to the big lake. The waves crashing on shore added to the calm or the drama, depending on the mood of the lake. We had a wonderful stay here. Kitchen was equipped with everything we needed and same as the rest of the condo. The home is wonderful. Easy location, and so nice to be able to check-in at the property rather than go to the office first. Kitchen is well appointed. Amazing views! Loved the fireplace. Would have preferred a second shower. The couches aren't the most comfortable, but very clean. It was 55 degrees in the house when we arrived after 11pm in weather below zero - and we didn't realize there were two thermostats! Would be so great for late check-ins to have someone turn on the heat in advance. It took several hours for the house to heat up to a temperature at which we felt like it was for sure working and we could sleep. The directions were misleading - I think they originate from the rental office? We were coming from the cities and got quite confused. Once we found the home it was very easy to find back. The townhome we stayed in was so incredibly cozy. Not sure how long this townhome has been around but the upkeep has been immaculate. I loved having movies, books, and games for my children to enjoy already in the unit. Upon walking in, our breath was taken away. GORGEOUS open-floor plan with a huge kitchen, dining room, and beautiful fire place. The huge picture windows on the main floor let the natural light flood in each morning - what a WONDERFUL way to start the day on the North Shore. I am a person who really pays attention to details and I wanted to make note of how beautiful the bedding is in each room. Love all the pillows! Thank you again for an incredible place for me and my family to enjoy while on the North Shore.